When I was growing up, they were simply “Christmas cookies” to me—not butter cookies or cutout cookies. 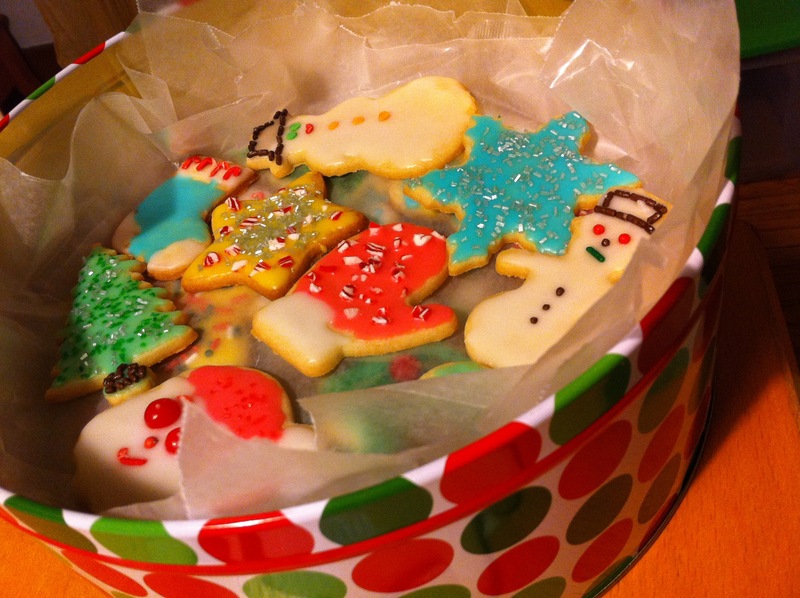 Just Christmas cookies: the quintessential sweet of the season. As an adult, I consider these classics a family recipe, but in truth, the five-ingredient list is hardly complicated, or a secret: butter, flour, sugar, an egg, and—most importantly—a half-teaspoon of real almond extract (imitation is forbidden!). First, as with all cookies, the butter and sugar are creamed together before adding the egg and almond extract. Then the flour is carefully stirred in. For years I had to hand over the spoon to my mom when the last cup of flour went into the bowl, and for years I was in awe of how strong she was, as I watched her effortlessly finish the job my wimpy arm couldn’t handle. After the dough was chilled (a step I was never a fan of waiting through), my mom and I rolled it out to a careful ¼-inch thick round ready to be puzzled into Christmas shapes. It was with Christmas cookie dough that I learned to use a rolling pin: gently but firmly, keeping the pressure even between left and right hands, learning to lift the rolling pin slightly as it reached the outer perimeter of the dough, so as not to leave the edges too thin to be cut. Opening up the tin of cookie cutters each December was as thrilling to me as unearthing my family’s boxes of tree decorations. All the old favorite shapes were there—stocking, tree, candy cane, wreath, star, santa, and the gingerbread boy and girl (which we didn’t hesitate to use on non-gingerbread dough)—as well as the surprise of a new cookie cutter or two we had added to the collection the year before. I learned to be strategic about arranging each shape before pressing it into the dough, minimizing the scraps of dough to be gathered and rolled out again. The outstretched leg of the reindeer nicely made use of a little strip of available dough left along the top of a tree’s point, and the positive points of one star could utilize the negative spaces left by another star. Frosting and decorating the cookies, though, was the best part of the process. The bowls of colored frosting and various sprinkles were laid out on the table, drawing the whole family as if they were a feast rather than work to be shared. Over the years, our approach became increasingly elaborate and creative. Armed with toothpicks, we discovered techniques for swirling two or more colors of frosting in the middle of a star, and for picking up and placing tiny candy balls exactly where we wanted them, along the hem of an angel’s dress. In his teens, my brother went rogue with his approach, transforming traditional shapes into entirely different objects—an upside-down stocking became a hobby-horse, and bell became a space shuttle, with USA spelled out carefully using those small, stick-shaped chocolate sprinkles. 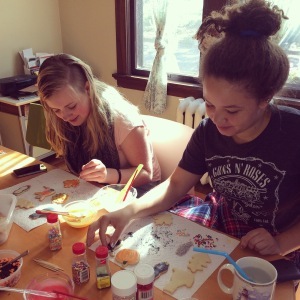 Our three daughters are now teenagers, and the “Christmas cookie” tradition continues—even beyond Christmas. Somewhere along the line, it occurred to me that “Christmas cookies” could be made at other times of the year, so I began buying new cookie cutters: tulips and rabbits, pumpkins and maple leaves, hearts and snowflakes. A few weeks ago, on a cold Saturday morning, we sat down around the dinning room table, where stacks of naked autumn cookies waited for their sweet, creative disguises. Each of the girls had invited a friend to join us. “I didn’t realize other people even did this any more,” one of our guests said, picking up a toothpick and getting intricate with her design. The cookies are definitely special—everyone who sees them and bites into one agrees. But for me, it’s the tradition of time spent together—evolving as our family evolves, yet remaining the same from year to year, in a life where it seems nothing really remains the same—that I crave most this time of year. This entry was posted in Food & Place and tagged baking, butter cookies, childhood, Christmas, cookie cutters, cookie decorating, cookies, family, holidays, memories, parenting, tradition. Bookmark the permalink. I must say: this is lovely. In a mixing bowl, cream 1 cup butter with electric beaters; gradually add 1/2 cup sugar, beating until light and fluffy. Then beat in 1 egg and 1/2 teaspoon almond extract. Gradually blend in 2 1/2 cups flower (switching to hand blending with a spoon, as needed). Gather dough into a ball, wrap in plastic, and chill (for at least a few hours). Preheat oven to 350 degrees. Roll out dough on lightly floured surface to 1/8″ – 1/4″ thickness. Cut with cookie cutters dipped in flour. Place on baking sheets. Bake 8-12 minutes (keep an eye out for reindeer legs and other thin sections that might burn!). Lisa, the misty-eyed happy posts are the best kind, I think! And I love having a chance to prove that I can write something that’s simply “sweet” (even if I did have to get a bit dark in my comment to Jen!). 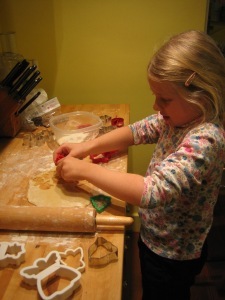 Your post has me thinking about what my girls will remember about the Christmas season, years from now. Sometimes I try too hard to re-create the wheel every year, to get the balance between “stuff” and meaning just right, to not be too consumeristic without becoming a grinch, etc. So every year I over-think things and try something new, forgetting that its the traditions they’ll remember. Your post reminded me (and just in time!) that the simplest things matter. Jen, this is a “happy post,” and I don’t mean to place it in a minor key, but your comment got me thinking. For a handful of years when my girls were young, I was struggling with depression, and then I was a single mom. After that, Jason and I were blending our two families, so there were plenty of other transitions. I guess what I’m realizing just now is that having this very simple tradition—one that took place every December of my life, like clockwork—was so necessary. Not only did it provide a framework of stability for my girls, but it allowed me to do something special with them that didn’t require a whole lot of creative planning and thought (which I simply didn’t have the energy for at least some of those years). I think those cookies have been more of a gift than I ever realized!